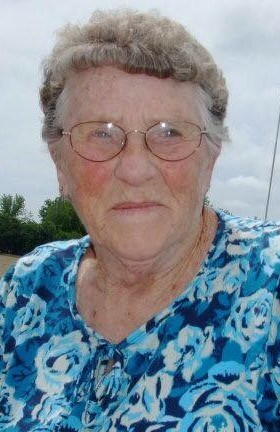 Doris M. Schnur, 85, of Cresco, IA, died on Monday, February 11, 2019, at Evans Memorial Home in Cresco, IA. Memorial services for Doris will be held at 11:00 a.m. on Monday, February 25, 2019, at Cresco United Methodist Church with Pastor Kayla Lange-Carney officiating. Visitation will be held one hour prior to the service at the church on Monday. Doris Mae Jacob was born in Marshalltown, Iowa, daughter of John and Rennatta (Fricke) Jacob. On February 24, 1951, she was united in marriage to William Earl Schnur at St. John’s Lutheran Church in State Center, Iowa. Doris was a social person who liked to sit and visit with neighbors on her porch. She was often seen riding her bicycle around town, and stopping by to say “hello” to family and friends. Doris was notorious for her long goodbye when company was leaving. She liked to cook, clean, play solitaire, and watch “The Price is Right.” In the winters Doris and Earl would drive their 5th wheel south for warmer weather. She enjoyed growing flowers, especially red geraniums, and watching hummingbirds flit from flower to flower. Doris is survived by one daughter, Marleen (Richard) Burgess of Cresco, IA., four sons, Michael (Terri) of Cresco, IA., Marvin (Sue) of Ridgeway, IA., Merlin of Cresco, IA., and Martin of Ridgeway, IA. ; 14 grandchildren; Chad Burgess and Chasity Griffith, Justin, Sarah, Cheyanne (Matt Ringoen), and Dakota Schnur, Torie (Ty Moeller), Travis (Katy), and Tanner (Sara) Schnur, Olivia and Josie Schnur, and Dylan, Darrian, and Devyn Schnur; 19 great grandchildren, 2 sisters Marie (Carl) Dreifke of Hubbard, IA, and Joyce Tinjer, and sister-in-law Elsie (Tom) Ryan of Cresco, IA. She was preceded in death by her parents, her husband Earl on March 25, 2003, 2 brothers Carl (Irene) Jacob, and Ernie (Darlene) Jacob, and her sister Betty (Ronald) Benson.